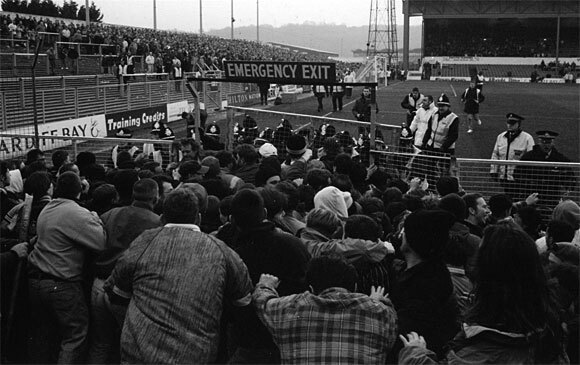 Cardiff City awaydays: Colchester United, 1993 – with pitch invasion! 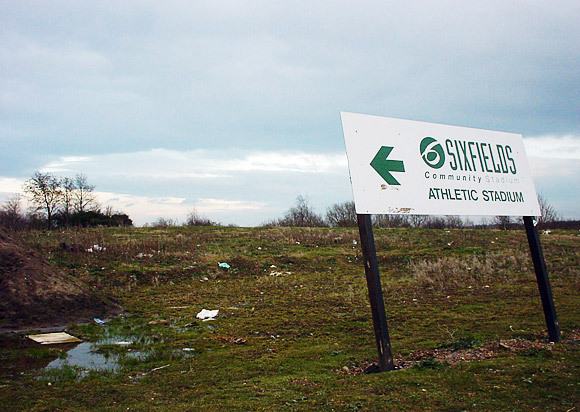 With Cardiff preparing for their third trip to Wembley in as many years, away trips like these seem a distant memory, but die hard City fans will have memories of many trips to the lesser known football outposts of the nation. 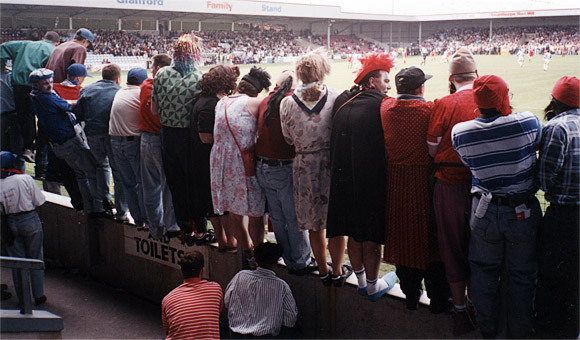 In this case, it was a Football League Two face-off in the south east of England, with Cardiff City travelling to Colchester United, on the 12th March 1993. Being a night game, there was plenty of time for both sets of supporters to get tanked up, leading to a fairly lively atmosphere inside the ground. There was a fair bit of noise in the ground, with Colchester’s squaddie following responding in kind to Cardiff’s taunts. I can’t remember too much (on account of the aforementioned tanking up) but I seem to recall Cardiff going behind and then scoring dramatically, sparking off a good old fashioned pitch invasion with a load of Cardiff ‘lads’ half heartedly ambling over in the direction of Colchester’s ‘boys’ before promptly returning to the terracing. 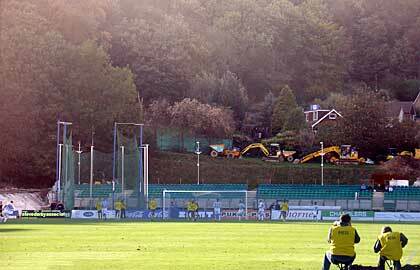 We eventually won the game 4-2. I think I may have missed out some of the details. I blame the Stella. Updates! 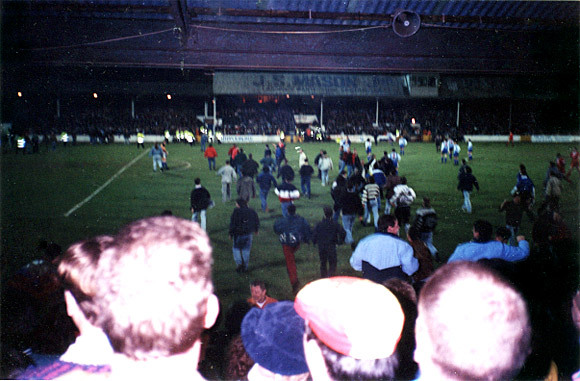 Thanks to posters on ccmb.co.uk and urban75, I’ve been reminded that it was a Friday night game and that the pitch invasion happened after we scored our third – putting us top of the league. Some Colchester fans got on the pitch as well and it turned a little spicy for a while, although it all handbags really. 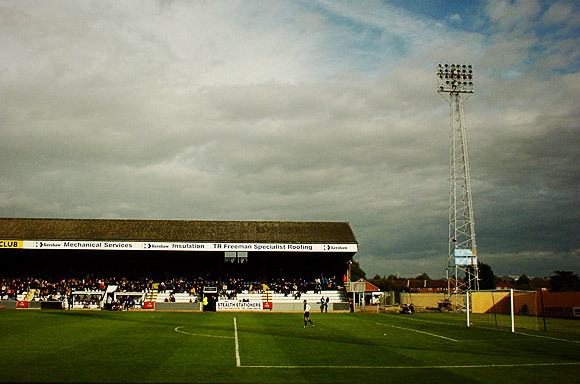 Colchester’s players were taunted throughout with chants of ‘Tesco bag, Tesco bag!’ on account of their blue and white strip.